A complementary configuration to the other Circulute series, NIDEC-SHIMPO provides a pulley style model that offers a compact footless drive option. The pulley style Circulute 3000 is available in three different assembly options; integral pulley, hollow shaft, and combination of both. It is available in three different frame sizes (B, C, D) and the same variety of ratios as the standard Circulute. Agitator or mixing applications: Input driven by pulley, Output is a hollow shaft connecting to agitator shaft. 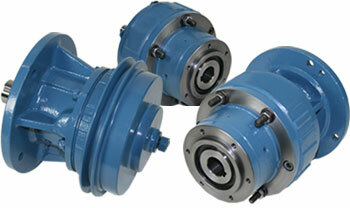 Larger turn tables or indexing: Input driven by pulley, Output is either a flange or ring housing allowing the gearbox housing to rotate with table. Spindle axis on metal cutting machinery: To work as a speed increaser the Input is a hollow shaft, Output is a pulley assemble. Two speed shifter: Two gearboxes in parallel, with Input driven by pulleys, Output is a flange or ring housing for first gearbox and Output is hollow bore for the second gearbox. These are few specific examples of applications using the pulley style Circulute, among many others. These are usually very unique transmission applications which we strongly recommend that you contact NIDEC-SHIMPO for support. The pulley style Circulute gearbox is assembled and supported from our local kit build facilities throughout North America – so excellent availability on all the different input and output configurations.